Once you've decided which real estate professional is right for you, it's time to sign on the dotted line. When it comes to signing a contract with your listing agent, the most common one you will encounter is the "Exclusive Right to Sell." This type of listing provides your real estate agent the "exclusive right to sell" your home. This means other agents representing potential buyers may also be involved, but even if your agent ends up sharing the brokerage fee with a buyer's agent, he or she is still guaranteed to earn something once the house is sold. This does not mean you pay more in commission. It simply means you pay the agreed upon percentage when the house sells, and if more than one agent is involved the commission is split between them. Why is an Exclusive Right to Sell best? This is the best bet for a home seller who wants to receive full service from their listing agent and the real estate company. Since your agent is guaranteed to be paid for their efforts, they will invest funds into marketing your home and invest their valuable time to make the deal happen. 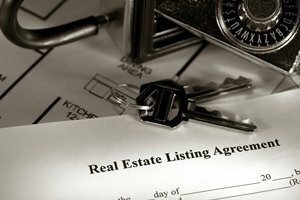 Under this type of listing agreement, your agent will advertise your home, place it in the Multiple Listing Service, market the home to other agents, and may host open houses. You may come across options for open listings and "One Time Show." A one-time show is similar to the open listing in that it is often used when a buyer's agent wishes to show a Home For Sale by Owner (FSBO). The seller will sign an agreement that identifies the specific potential buyer viewing the home and agrees to pay a commission to that agent if that specific person purchases the home. This prevents the buyer and seller from negotiating with each other later and prevents attempts to avoid paying the agent's commission. Real estate agents agreeing to this contract would not spend money on marketing the home and would not place it in the MLS. When selling your house your real estate agent acts as a professional extension of you, the seller, by making certain that you sell your home for a much as you can, in a reasonable amount of time. They understand contracts and disclosures and all that needs to take place before you finally receive that sought after check from a buyer. But, how do they get paid for their work? You pay your agent by way of a commission, which is agreed upon in your listing contract. The commission is a percentage of the final selling price you agree upon with your buyer. You should keep in mind that there are usually two agents involved in most real estate transactions. Most of the time, part of the commission you pay goes to your listing agent's company and your agent, and the other portion goes to the company representing the buyer and the buyer's agent. At what point has an agent earned their commission? Your listing agent's job is to bring a "ready, willing, and able" buyer's offer to you. If you reach an agreement with the buyer, then the agent has done the job and earned the commission. After you close the deal, the agency and your agent gets paid their commission out of the proceeds of the sale. However, say for example the buyer loses financing or backs out of the deal and your house is then back on the market. Your agent has not earned the commission yet. You are all back to square one. If you, the seller, back out or do not accept an offer that meets the price and terms of the listing agreement, your agent still earned their commission. The key here is to make certain you really want to sell your house for the price and conditions you agreed to in your listing agreement.